It’s a weekday evening, the kids are in bed, you’re getting ready to crawl into bed to catch up on some of your recorded TV shows – what do you grab as a snack? Do you go for the salty snacks? Stay healthy with a bowl of fresh fruit? Enjoy a big bowl of ice cream? As I’m sure you’ve already guessed from my recipes page, I’m a big fan of sweets. Cake is one of my many weaknesses but I don’t usually bake a full cake unless it’s someone’s birthday. A delicious way to enjoy cake as a midnight snack (without having to share!) 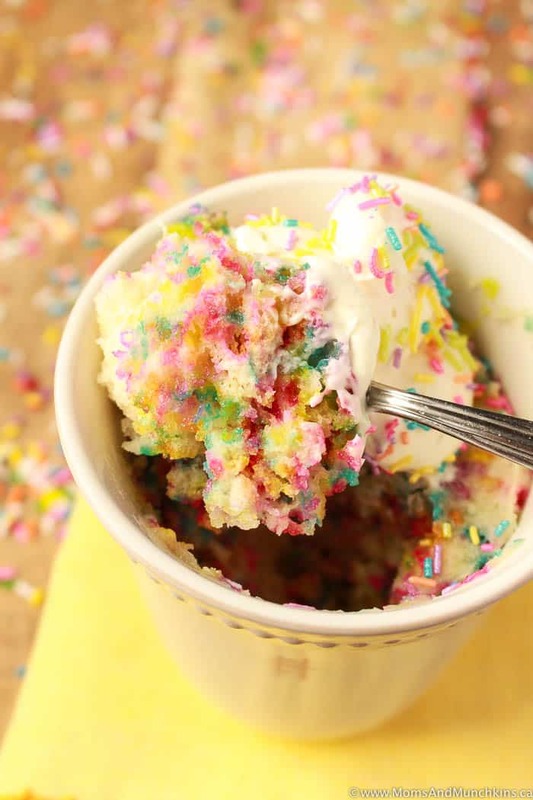 is to make this Funfetti Mug Cake! Yes, you can make a cake in the microwave in less than 5 minutes! When you’re done enjoying your dessert, just put the mug in the dishwasher and your kids will never know you ate cake after they went to bed…unless you leave a trail of sprinkles. Better sweep those up before the kids wake up. You can enjoy this Funfetti Mug Cake without a scoop of vanilla frosting or ice cream on top but come on…calories don’t count after supper, right? 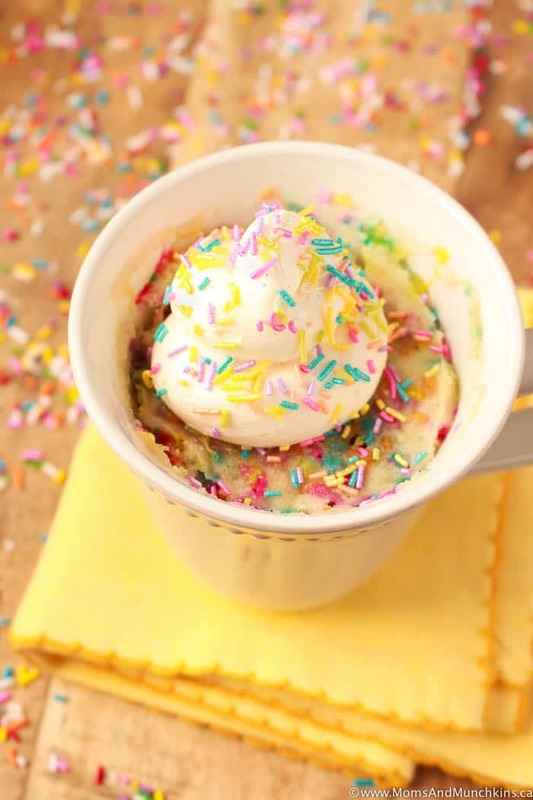 From start to finish, you'll be enjoying this Funfetti Mug Cake in under 5 minutes! Place flour, sugar and baking powder in a mug and stir to combine. I use a 16 ounce mug just to make sure it doesn't spill over while baking in the microwave. Pour in milk and vegetable oil and stir until there are no lumps left in the batter. Stir in two tablespoons of sprinkles. Microwave on high for approximately two minutes. The time depends on your microwave. Some are done in as little as 70 seconds but I usually bake mine for a full two minutes. Top with vanilla frosting or ice cream plus the last tablespoon of sprinkles. Love chocolate cake? 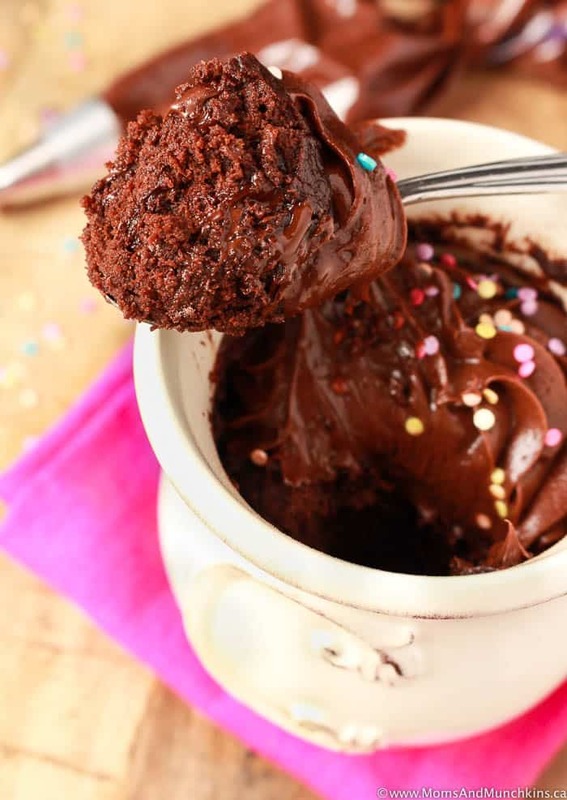 Trust me when I say you MUST try this Double Chocolate Mug Cake. Oh, so yummy! You’ll find more sweet treats on our Desserts page. Stay updated on the latest by following us on Instagram, Facebook, Twitter and Pinterest.